Note : the viewer doesn't display the raster contents of the charts but only the geographical coverage. The GeoGarage platform also serves images of vector ENC Electronic navigational charts as a complementary offer to the different raster nautical charts (RNC) layers for its B2B customers ( see GeoGarage blog article). 1 : Overview scale band consists of ENC files with a scale band smaller than 1:1,500,000. 2 : General : from 1:600,001 to 1:1,500,000. 3 : Coastal : from 1:150,001 to 1:600,000. 4 : Approach : from 1:50,001 to 1:150,000. 5 : Harbour : from 1:5,000 to 1:50,000. 6 : Berthing : larger than 1:5,000. Note : The ENC filename is stored in the attribute named DSNM from the “coverage_area” feature layer. The third character within the filename is a numeric value referencing to the following scale band category. For example, a filename of US2EC02M.000 indicates that it is within the General scale band category. 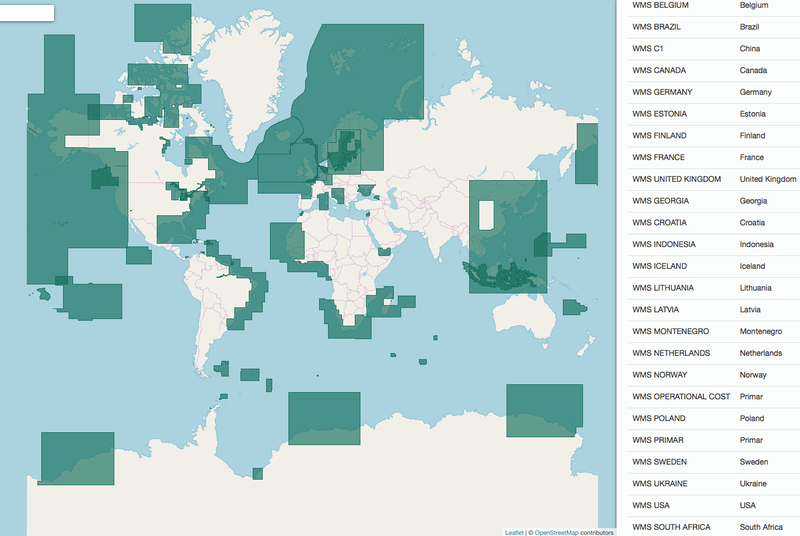 So this implementation of ENCs (worldwide catalogue of about 14,000 charts) allows to complete the catalog of available nautical charts (more than 10,000 raster charts) usually proposed by the GeoGarage platform, for regions where the GeoGarage can't access -for the moment- to raster data (pending licenses with some international Hydrographic Offices ) for webmapping applications. The following countries are concerned by s-63 ENcs for web services : China (C1), Estonia (EE), Finland (FI), Georgia (GE), Indonesia (ID), Lithuania (LI), Latvia (LV), Montenegro (ME), Poland (PL), Sweden (SE), Ukraine (UA), additionnaly to other countries for which we already have licenses for raster data and for some of them vector s-57 ENCs : Belgium (BE), Brazil (BR), Canada (CA), France (FR), Germany (DE), Croatia (HR), Iceland (IS), Malta (MT), Netherlands (NL), Norway (NO), South Africa (ZA), Spain (SP), United Kingdom (UK), USA (US). GeoGarage can propose several types of visualizations with the ENCs depending on the specifications of the customer.